Astaberry have presented their Oxy+ Bleach Crème to provide an everlasting and extra glow to your skin. This bleach is apt for those who want to kindle their magnificent persona with their ever glowing and indelible charisma. Astaberry Oxy+ Bleach Crème has a long lasting effect that rejuvenates your skin, uplifts it and promises on providing an extra glow to the skin. This is ideal skin bleach for women longing an attractive and radiating skin. This bleach is united and arrives in a yellow colored packaging which is very alluring and satisfying. This crème totally enhances the skin of women, leaving them more confident and radiant. Wine Bleach Crème is prime and foremost face bleach that must in every girl’s vanity at just Rs.75 for 42 grams and is available all across retail, modern outlets and also on e-commerce portals. 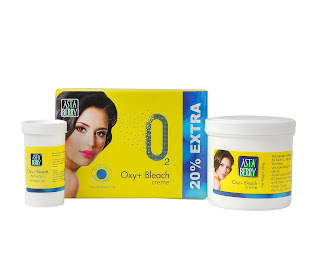 If you are looking an everlasting glow and fairness on your skin, then you must go in for Oxy+ Bleach Crème by Astaberry Biosciences.